Canadian manufacturer Arizer has quietly become one of the market leaders for vaporizers, known for producing high-quality pieces of hardware that implement the latest vaping technology. 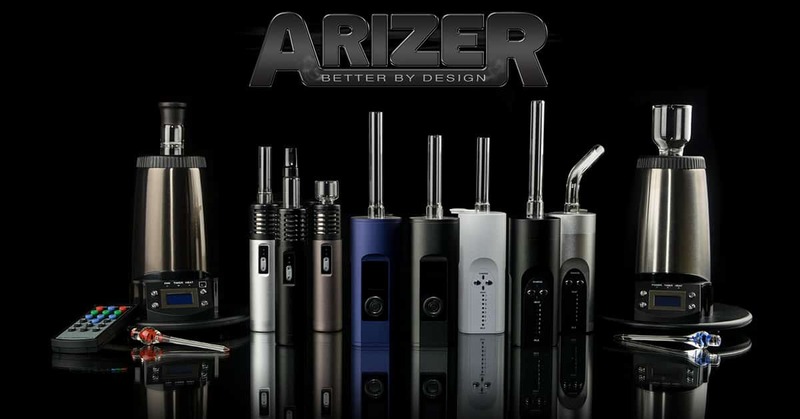 As a result, the Arizer vaporizer range are among the best-selling vapes, with notable models including the Arizer Solo 2, Arizer Air 2, and the Arizer Extreme Q.
Arizer vaporizers range in design, size, and function, with both portable and table top products capable of vaporizing dry herbs and oils. The vaporizers are highly regarded thanks to their use of quality components that ensure the products last for many years to come, with each Arizer vaporizer coming with a manufacturer’s warranty. Of course, the main selling-point of any Arizer vaporizer is how good of a vape it produces. Whether your state is recreational or you have a medical card, vaping is one of the healthiest and most efficient ways to consume cannabis. By vaporizing at high temperatures, an Arizer vaporizer produces a high-quality cannabis vapour that tastes fantastic and gets you high without needing to smoke a joint. While joints are often viewed as cheaper and easier for smoking, a quality vape such as the Arizer Solo 2 is a much more discreet method of smoking, is simple to use, provides a fantastic high, and offers unique tasting notes unlike any other smoking method. Most importantly – it’s healthier to vape! A vaporizer doesn’t produce the harmful smoke as smoking a joint does, meaning it’s better for your long-term health. Plus, by vaporizing the cannabis instead of burning it, you enjoy a high concentrate of THC, meaning it will get you higher so your weed lasts longer – talk about value for money! Now you know why you should own Arizer, let’s take a closer look at some of the products available. One great thing about the company is the fact that there are a wide range of vapes to choose from, meaning you can find something to suit your preferences, whether it’s dry herbs, oils, or a bit of both. The Arizer Solo 2 is an upgrade of the Arizer Solo, which was one of the company’s first products available back in 2011, and it’s without a doubt one of the best portable vapes on the market. Released in spring 2017, the Arizer Solo 2 features an affordable entry-level price, compact design, and high performing heating element that result in one of the best portable vaporizers currently available. One of the most recent upgrades, the Arizer Air 2 features a few notable improvements over the original Air, including 50% higher batter capacity, quicker heating times, USB charging, and custom settings for your vaping preferences. Arizer’s flagship table-top vaporizer, the Arizer Extreme Q is a powerful piece of vaping hardware that utilises pure convection heating for an incredible vaping experience. It’s a large vaporizer that is fantastic for sharing with your friends, with the Arizer Extreme Q filling up a sizable balloon with a pungent and powerful vape. A New Arizer Vaporizer Coming Soon? While there has been no official word on an upcoming release from Arizer, it’s safe to say the company will have something new up its sleeve for 2019, or even late 2018. The Arizer ArGo was released early 2018 to rave reviews, and since the company had a very successful 2017 with their double release of the Arizer Solo 2 and Arizer Air 2, could we expect something new around the corner? Perhaps an upgrade on one of the table-top vaporizers could be in order. There has yet to be a second-generation model from the table-top range, so there may be an upgraded model due soon, while it wouldn’t be surprising to see Arizer release something completely new!